Mississauga Real Estate, Homes, TREB & MLS Blog by Mark Argentino: When is the best time to sell your home in the GTA? When is the best time to sell your home in the GTA? I just read this article below that was sent to me by a client. It contains great information about when to sell your home. Like everything in life, there are always exceptions to the rules. Personally, I like these exceptions, as nothing is predictable – especially selling a house. Still, it's good to know the basics, do your homework and factor in the required timelines. Statistics show that spring is the best time to sell a house. You may read conflicting reports that will say March to May, or they may lump in April and July in to those calculations. 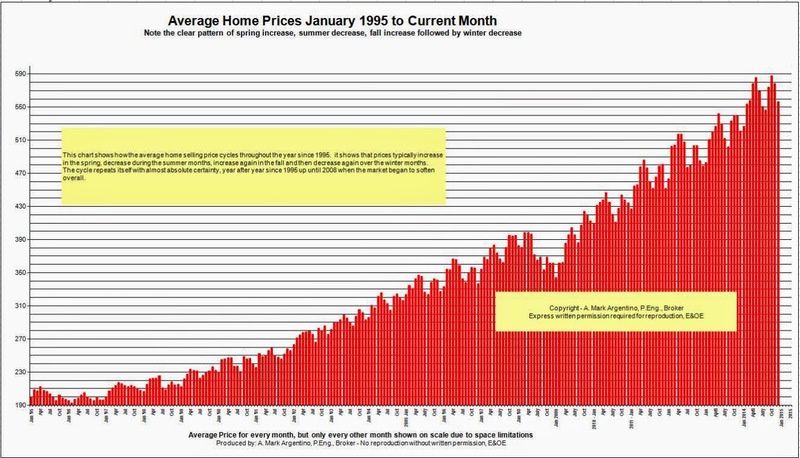 However, with the recent real estate climate in the GTA, there really isn't a bad time. What you're selling can influence the time of year you choose to sell. If you're listing a resale home, in order to buy a new home, you have to realistically factor in the closing date and, perhaps, add-on a bit of wiggle room. If you're listing a condominium or have to give the appropriate two-month notice to a landlord, you may not have to worry about the time of year as it relates to children starting school- unless the children are yours. Starting a new school year at the beginning of September, and ensuring that kids can finish up the year at their old school, is one of the most important concerns for parents of school-age children. In this scenario, the family would prefer to move during the summer months, so count back and consider the following. If your home is located in a family-friendly area, close to schools, shopping, etc., a new family will want to relocate during July or August. Count back three months, as most offers ask for a 90-day closing. With this in mind, you'll want to have signed a deal by April. Again, if you're situated in the GTA, chances are that your home won't be on the market for long. But if you live in a rural area, or have a character property that’s quite different from the norm, you'll need to build in more selling time. There are some advantages to listing your house earlier in the calendar year, rather than waiting for spring. Because the summer scenario is so popular, most people list their homes around April, which means there’s more competition. If you list your home in February, you may have other advantages. During the winter months there's a lower supply of houses on the market. Also, maintaining your property requires less work on the outside at this time of year, since you don't have to tend gardens and keep the grass cut. Many of my clients have experienced a successful rate of return when they list in February. Those people who are looking to buy in September or October may be looking for a better deal after the peak months have passed. Some agents will tell you that your house will sell quicker and closer to the asking price, if you list between Halloween and the New-year. Homes look their best in the late summer and early fall. Gardens are mature, lawns (depending upon the weather) may be lush, and with a hint of autumn tingeing the air and the leaves, fireplaces can be lit and the ambiance created by indoor, and outdoor, lighting - all help to enhance the curbside appeal. Still, there are no hard and fast rules. If you're selling and buying, it's always a juggle, so try not to have all your balls in the air at once. Have a plan, and choose the timing that's right for you and your family.